The IIMS is an award-winning, recognised educator of marine surveyors and has been doing so successfully for more than 15 years. The Institute is as committed as it is to delivering the best education for commercial ship marine surveyors as it is passionate about developing the next generation of surveyors. The course material is current, accurate and is regarded to be the best material of its kind anywhere in the world at this level. 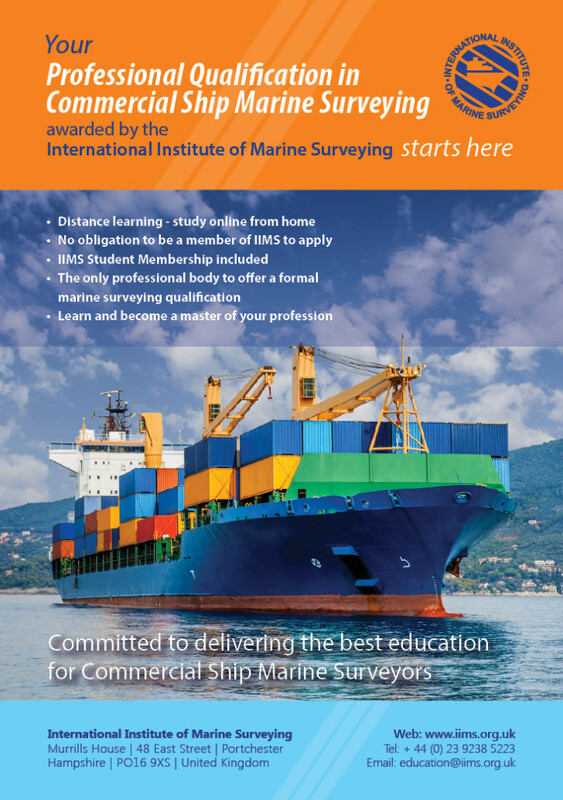 Furthermore, IIMS is the only professional body to offer a formal marine surveying qualification. It has been produced by authors who are passionate and knowledgeable about their specialism and who are recognised experts in their fields. The course has been written to produce the best possible learning outcome for those who study it. The Commercial Ship Professional Qualification in Marine Surveying course allows you to decide when and where you want to study. To achieve the qualification you are required to study and pass four CORE units plus an additional four SPECIALIST units of your choice from the twenty-seven that are available. Students have two years to complete the course. It is then possible to upgrade your qualification to an Advanced Professional Qualification in Commercial Ship Marine Surveying. This means a further one year of study and an additional four SPECIALIST units to pass. If you travel or spend time at sea, you can take the units with you to continue studying and make good use of your travelling time. To read in more details about the content of each Unit, click any of the links below. Read what students who have studied with IIMS have said. ‘I would like to thank all involved in the very valuable and excellent course. It certainly lived up to my expectations and more’.